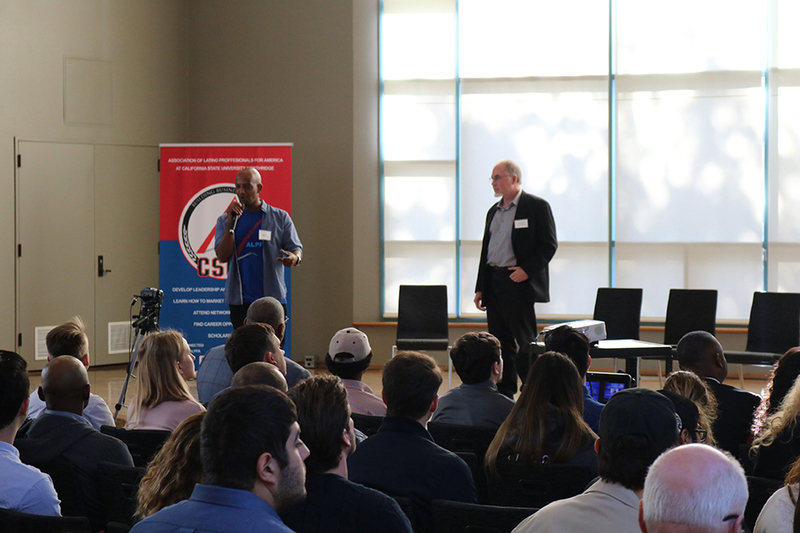 Accounting and finance student Alula Zeryihun introduces keynote speaker Harry Goodnight '86 (M.S., Computer Mathematics) at the first-ever Blockchain Summit on CSUN's campus. Photo by Gabriel Dorame. 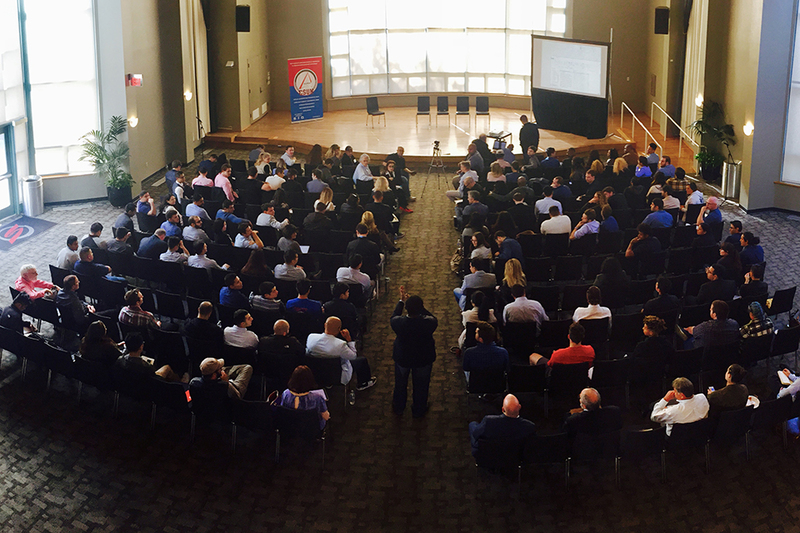 The Blockchain Summit, which took place at the University Student Union's Grand Salon, attracts more than 100 attendees. Photo by Gabriel Dorame. Sandy Green, professor of management (second from left), serves as the moderator at the summit. Here, he sits with the first panel, "Blockchain in Action." Photo by Gabriel Dorame. The second panel, "Initial Coin Offerings, Cryptocurrency and Fiscal Policy," features two entrepreneurs as well as a CSUN professor. Photo by Gabriel Dorame. 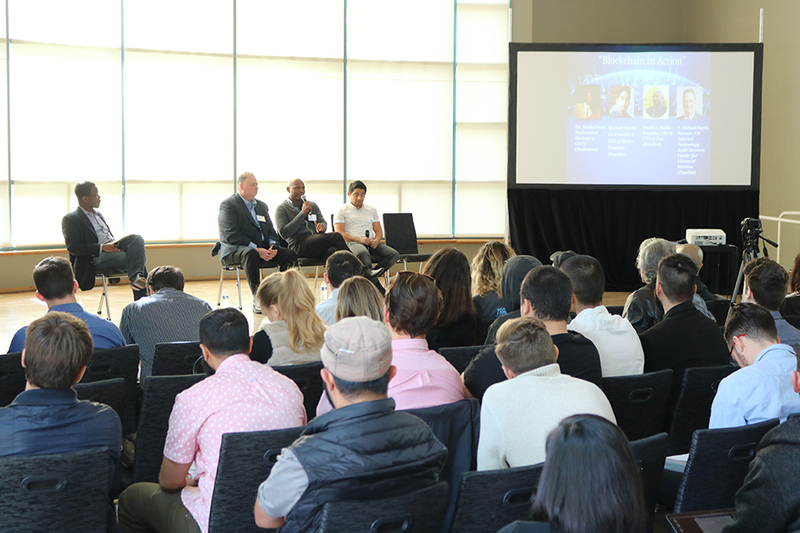 Six months after the bonfire, Zeryihun, Santiago Cuevas, Manny Vergara and other members of California State University, Northridge’s student Association of Latino Professionals for America (ALPFA) brought together finance executives, entrepreneurs and professors for the campus’ first-ever Blockchain Summit, Dec. 2 at the CSUN University Student Union Grand Salon. The summit topic was not just cryptocurrency, but also the underlying technology for cryptocurrencies such as Bitcoin and Ethereum, commonly known as the blockchain. Put simply, the blockchain is like an unchangeable ledger for all cryptocurrency transactions. The summit featured a keynote speaker, two panel discussions, and a lunch and networking session during the intermission. Harry Goodnight ’86 (M.S., Computer Mathematics), executive advisor at Sweetbridge, Inc. — a company building a blockchain alliance and designing protocols for commerce, supply chains and interest-free loans — served as the keynote speaker. Goodnight talked about his experience as a CSUN alum and explored concepts such as how the blockchain could be applied to management of supply chain, a connection or network of parties all within the same creation process. For example, the supply chain for a cell phone would include the vendors for design and development, manufacturing and distribution. The first panel at the summit, “Blockchain in Action,” aimed to educate the audience about how blockchain works. 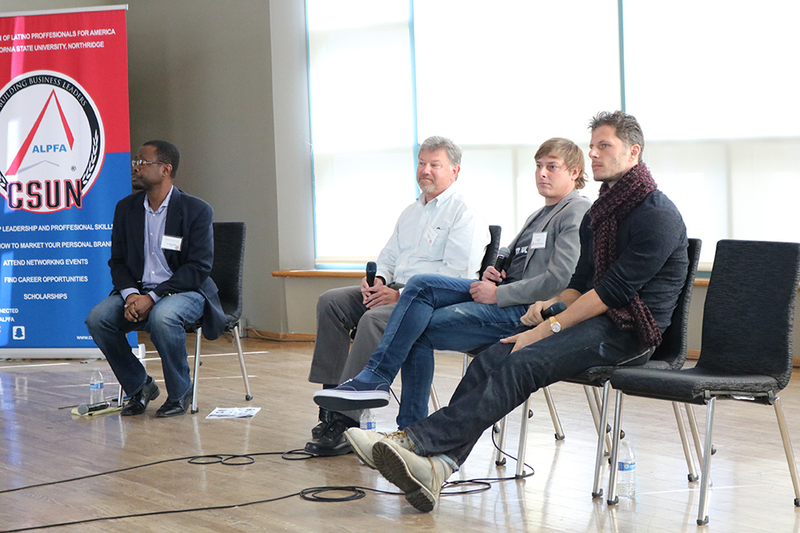 Panelists included partners at established accounting firms and app developers. The panelists explained that blockchain is what prevents double-spending of Bitcoins and explored the pros of the technology, such as the fact that it is a widely verifiable ledger — since it’s on a peer-to-peer network — and cons, such as the fact that most projects have not yet proven to be efficient. “Initial Coin Offerings, Cryptocurrency and Fiscal Policy,” the second panel at the summit, featured entrepreneurs and CSUN professor James Dow, who served as a skeptic. For example, Dow explained the importance of federal fiscal policy and the risk of investing in cryptocurrencies. Chris Kline of BitcoinIRA, who was a guest on the second panel, said he was in awe of CSUN students’ level of enthusiasm surrounding cryptocurrencies and blockchain.